Students at Merchantville Public School linked arms in solidarity during the National Student Walkout March 14. Credit: Scott Strong. 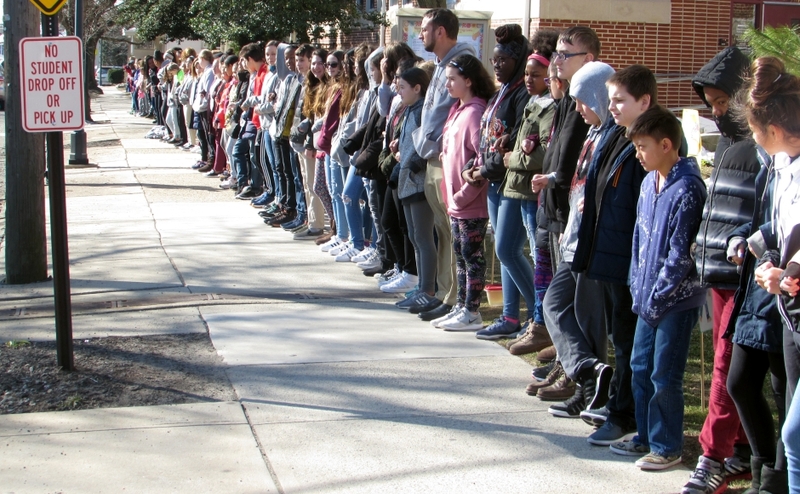 Students at area schools participated in coordinated demonstrations, expressing solidarity with the victims of the Parkland, Florida school shooting and advocating for their safety and security. Students at Haddon Twp. High School held an assembly in observance of the National School Walkout March 14. Credit: Matt Skoufalos. 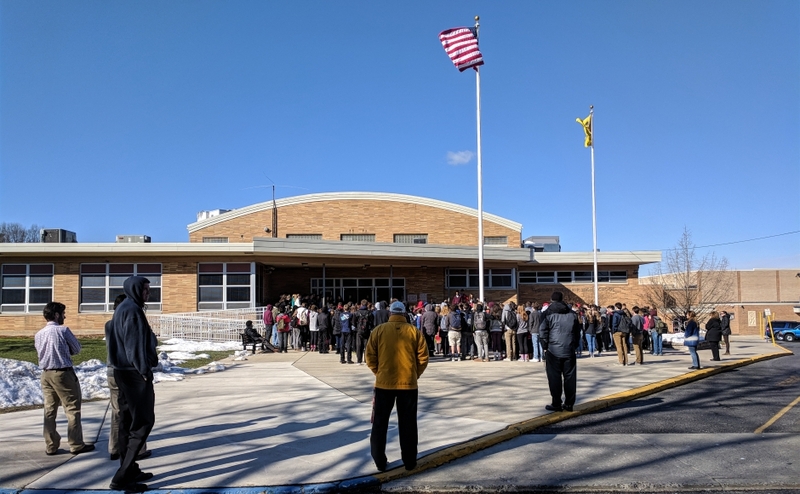 At 10 a.m. Wednesday, dozens of Haddon Township High School students stood in the morning chill, the wind whipping flags overhead, as they stood vigil for the lives lost in the Valentine’s Day shooting at Marjory Stoneman Douglas High School in Parkland, Florida. Led by members of their student government, they held an observance free of political ideology but awash in emotional depth. A choir sang as district personnel looked on from the parking lot, bubbles blew in the wind, and student leaders urged their classmates not to take their self-advocacy for granted. “Today is solely for the purpose of respecting the lives affected by this act of violence,” said HTHS class secretary Paige DeAngelo. The ceremony at Haddon Township High School was one among thousands held across the country during the National School Walkout, a country-wide demonstration advocating for tighter gun control in schools. Jill Shaughnessy, Community Service Coordinator for the HTHS student government, urged students to remember that walking out “represents our strength. HTHS Student Council President Solomon Boukman asked those gathered to consider the fates of those who are “systematically silenced due to age, background, sexual orientation, or gender. Boukman challenged those in attendance to “step out of their comfort zone even more so and contemplate the views of others you do not necessarily align yourself with. “In doing so I hope we can come to an intrinsic unity, similar to what we have here today,” he said. Strong said the topic allowed the students and staff to begin an important chapter in two-way conversation, one upon which he expects to rely more frequently. Merchantville students stand together with school pride. We love our school. Our students decorated the lawn with art work promoting school pride. Students stood together to promote a safe school environment for all. In Haddonfield, teachers, administrators, borough commissioners, and members of the local school board marched down Kings Highway in solidarity with students and educators across the country. Many carried signs with the anti-violence slogan, “Enough is enough,” the rallying cry behind the push led by Stoneman Douglas students for stricter gun laws. At Haddon Heights High School, Principal Eric Rosen oversaw an assembly conceived by students and facilitated by staff. 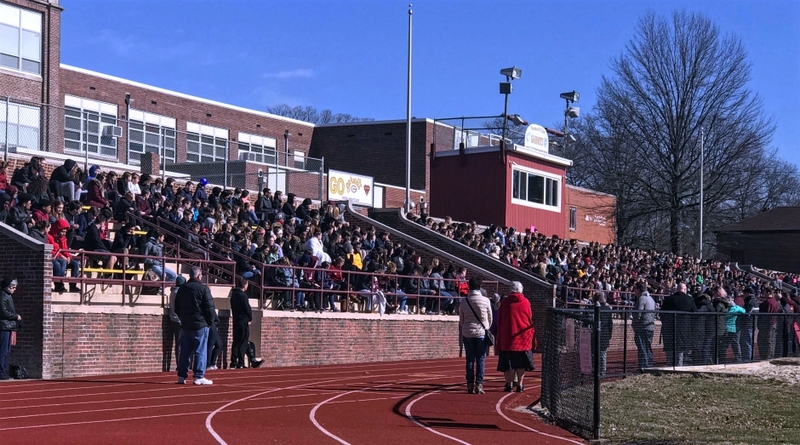 Haddon Heights High School students conceived and produced an assembly during the National Student Walkout March 14. Credit: Amy Campanaro. In all, 17 students and staff members, one representing each life lost in the shooting at Stoneman Douglas, read those students’ names, ages, and some personal details about them. A Haddon Heights football coach read the name Aaron Feis, the assistant football coach at Stoneman Douglas who died in the shooting. “We had three student speakers delivering heartfelt speeches regarding change, and how we can help each other,” Rosen said. “I’m truly amazed by the thought and the passion that our students had in implementing this and delivering it today,” Rosen said.